More than 150 years ago, delegates from Virginia’s Convention of 1861 were tasked with deciding whether the commonwealth would secede from the Union. 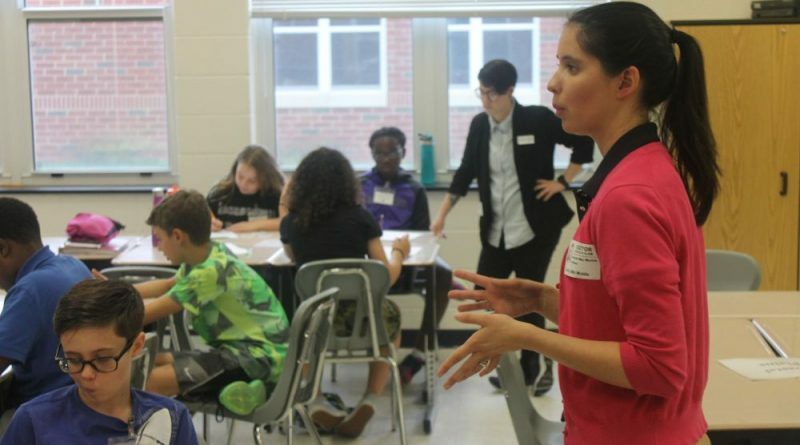 As part of Morven Park’s “From Many to One” program, sixth graders at Smarts Mill Middle School on Friday were given the same task, putting themselves in the delegates’ shoes to determine the fate of Virginia. As part of the program, the students were also given the responsibility of working together as groups in making a decision, while switching from region to region in the classroom. This time, Morven Park’s team was joined by representatives from the Jack Kent Cooke Foundation, which showed its support for the program with a $35,000 Good Neighbor Grant on April 26. The grant will support Morven Park’s civics education program, the Center for Civic Impact, and other elements of its K-12 programs. Gwyneth Mac Murtrie, Morven Park’s director of education, said the grant opens up opportunities to provide supplies like booklets for their programs. The K-12 lessons, part of the Center for Civic Impact, teach students about civic compromise and working together while tying in the material being taught in their classes. Murtrie said the program not only teaches students the history lessons they learn in school, but also how to make a civic impact in their community. The goal is to help them blossom into citizen leaders. The grant, she said, will only help their program grow.